Another National Conference is in the books, and the NDEO staff wanted to take a moment to reflect on our experience in La Jolla, California at the 20th annual convening. 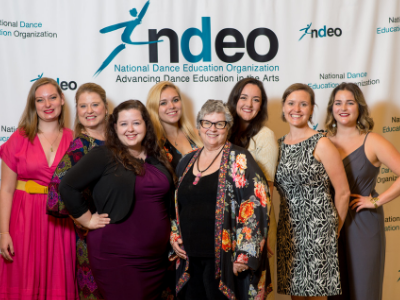 The theme of “Connection, Knowledge, and Leadership: A New Era in Dance Education,” proved to be particularly inspiring, and we were thrilled to celebrate the many ways that NDEO and our members are having an impact on the field of dance education. We always value the opportunity to connect face-to-face with members and colleagues to learn more about the important and exciting work that you are doing. Here are just a few of the moments that stuck with us this year! We are already hard at work preparing for the 2019 National Conference, The Creative Process: Choreography, Choice-Making, and Communication, to be held Thursday, October 24 - Saturday, October 26, 2019 with pre-conference Intensives on Wednesday, October 23, at the Hyatt Regency Miami, FL. Make plans to join us - we hope to see you there!